This webinar will focus on the Family Peer Advocate (FPA) Professional Credentialing process. You will learn about the requirements and eligibility criteria a person needs to meet to receive a Family Peer Advocate Professional credential, including a page-by-page review of the Professional credential application, including tips on how to best complete each of the sections. This webinar is Part 2 in a two part series on the Family Peer Advocate Credential. 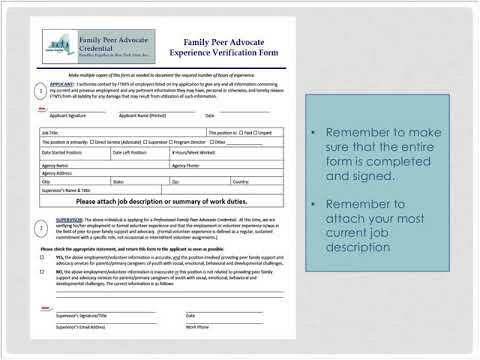 If you are looking for information on the Provisional credential, please see Part 1of this series where we focused on the Family Peer Advocate Provisional Application.